All of us have wondered at some point the growth of certain cities in terms of appreciation in its real estates while others remaining constant or some going down. Magazines such as “India Today” etc carry out an annual issue highlighting such a trend and some of the newspapers also carry out such analysis. A question is often asked – Do we have an authentic index of cities based on its movement of residential properties valuation? Yes, we do have ! Its called RESIDEX prepared and managed by National Housing Bank(NHB). I didn’t know till a detailed presentation was made on this index in one of its Board meetings upon my joining and after detailed analysis, I am of the opinion that it’s certainly the best index in India of cities and it’s movement (upward or downward) from a base year and one of the best and most neutral Index when compared with similar such indexes internationally. Let me explain the genesis of this index, it’s constitution and then we will have a look at this index. Keeping in view the prominence of housing and real estate as a major area for creation of both physical and financial assets and its contribution in overall National wealth, a need was felt for setting up of a mechanism, which could track the movement of prices in the residential housing segment. National Housing Bank, at the behest of the Ministry of Finance, prepares such an index at the National level. A Technical Advisory Group (TAG) comprising representatives from Ministry of Finance (MoF), Reserve Bank of India (RBI), Central Statistical Organisation (CSO), National Sample Survey Organisation (NSSO), Labour Bureau, State Bank of India (SBI), Housing Development Finance Corporation Ltd. (HDFC) and ICICI Home fiancé ltd. Was constituted to guide and approve the Index before its release. The pilot study covered 5 cities viz. Bangalore, Bhopal, Delhi, Kolkata and Mumbai, for which index was constructed till the period 2005 taking 2001 as the Base Year. Based on the results of the pilot study and recommendations of TAG, NHB launched RESIDEX for tracking prices of residential properties in India, in July 2007. On the recommendation of TAG, Base Year was shifted from 2001 to 2007 to make it as recent as possible so as to reflect changes in the housing prices more accurately. At the same time, 10 new cities were added taking the total number of cities covered to 15. Subsequently 5 cities were added from the quarter January-March, 2012 and 6 more cities were added from the quarter January-March, 2013. NHB RESIDEX now covers 26 cities. NHB RESIDEX was released on half yearly basis uptil 2009. From quarter Jan-March, 2010 onwards, RESIDEX is being updated on quarterly basis. The Residex takes into account the price trends for residential properties in different locations and zones in each city. Data on the transactions are collected from diverse sources (14 Banks & 12 HFCs covering about 50-60000 transaction data & also market data from NCAER) and are classified, validated and applied to the model designed to give the representative Index for each city. Let’s now look at this index – I have arranged the cities in descending order based on the valuation of the residential property potential. 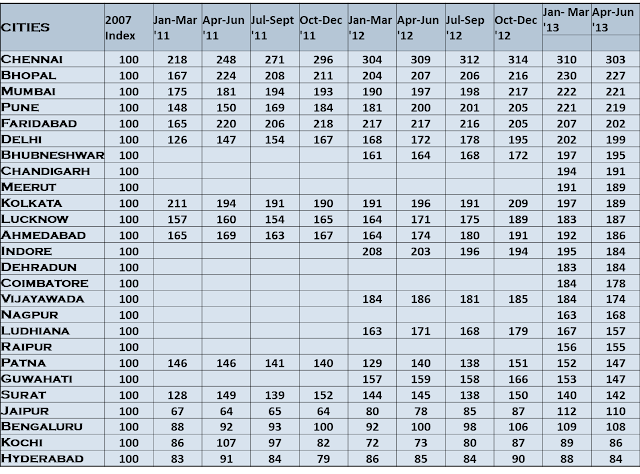 The base year value in 2007 is kept at 100 and the present value (April-June 2013) shows its value as on date. While Chennai, Bhopal, Mumbai, Pune & Faridabad are top five cities in its appreciation, Hyderabad, Kochi, Bengaluru, Jaipur & Surat are the cities with lowest appreciation in this list of 26 cities. Hyderabad & Kochi are the only two cities which have actually witnessed a decline in the real value when compared with 2007. Another emerging trend is the growing importance of mid-level cities such as Meerut, Faridabad, Bhubneshwar, Indore, Coimbatore etc. This also is due to growing purchasing power of middle class and enough savings for people to invest in residential properties. A welcome movement also has been proliferation of good quality modern multi-storey apartments in these cities. The index is being computed by using Price Relative Method (Modified Laspeyre’s Approach). Under this method price relatives are calculated only once (at the basic stratified unit) and the weighted average of these price relatives leads to the index at next level and so on. I. The selected city level market has been first segmented on the basis of the municipal administrative zones or property tax zones, based on the applicable zonal segmentation done by the city authorities. ii. Thereafter, selection of locations has been done on the basis of their spatial distribution across the city. iii. In each of the selected colony, both new and resale housing units have been included, including flatted and plotted developments, developed by various housing agencies, including public housing agencies, private developers, cooperatives and informal land assembly mechanisms. The construction of index follows a three-stage approach. In the first stage, the average price for all the three categories in the zone is arrived at by taking simple average of all the prices pertaining to that category in the zone. Thereafter a weighted average price is calculated for the Zone by taking transaction based weights for the 3 categories of Built-up -area. These transaction based weights are fixed since 2007 and were calculated on the basis of number of transactions received for three different categories in that year. The total of the weights is 1. In the second stage, the weighted average prices for the Zone is multiplied by the factor assigned to that Zone on the basis of Housing Stock or population of that city. The total of the factors assigned to various Zones in a city comes out to 100. In the third stage, the Zonal indices are calculated by taking the prices relatives of the current year and base year. City index is calculated by aggregating the zone level indices using area covered in different zones/housing stock during base year as weights. The Residex is expected to bring greater uniformity and standardisation as well as greater transparency in the valuation of properties across the industry. Uses of NHB RESIDEX - The Index helps the general consumers and property buyers and borrowers in their decision-making by enabling comparisons over time and across cities and localities based on the emerging trends. The Residex also provides insights into the property market for the lending agencies in their credit evaluation and assessment of the value (present and potential) of the security against the loan. NHB RESIDEX can be a useful indicator for estimating the value of property to be financed and also for assessing the value of security cover on the outstanding loan. Builders and developers may also benefit from the index by assessing the demand scenario in a locality, and mapping the housing needs in different parts of the country. NHB RESIDEX may be useful to policy makers, banks, housing finance companies, builders, developers, investors and individuals. NHB RESIDEX is being well-received from all the corners of the industry e.g. banks, HFCs, Builders & Developers and Government (Economic Survey). NHB shares the RESIDEX with RBI, Banks and Housing Finance Companies for enabling them to initiate appropriate policy measure including formulation of business plans. 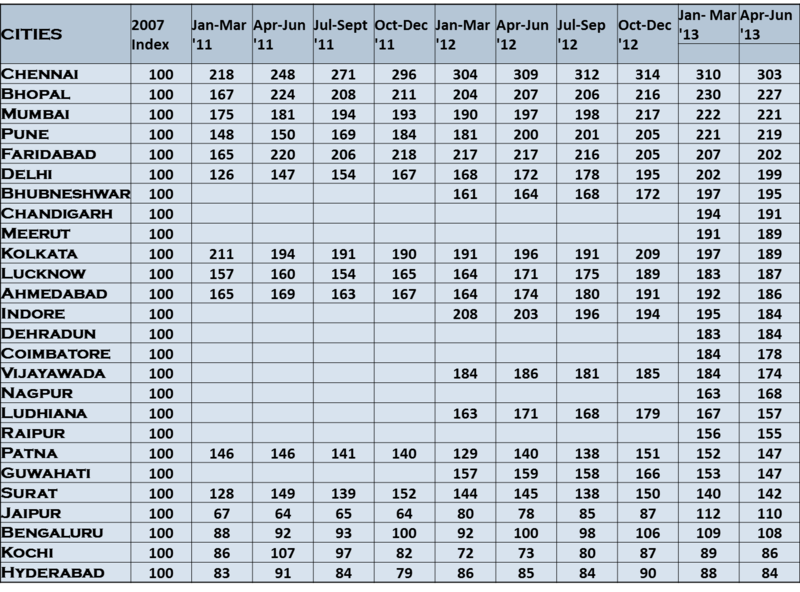 NHB RESIDEX has been mentioned as the authentic and official Housing price Index for India in different publications e.g. a book on “The Price of Land – Acquisition, Conflict andConsequences by Sanjoy Chakravorthy” has extensively used NHB-Residex to draw many conclusions. As per this book, the Residex prices have been considered good estimates because they are based on real transactions. NHB plans to increase the number of cities further to cover all 63 JnNURM cities over a period of time. It also proposes to increase the frequency of Residex from quarterly to monthly basis. Further, to make it keep up with times, NHB plans to change the base year from 2007 to 2010 to make it more contemporary. NHB also plans to undertake various correlation studies (cause and effect) between the price trend in the cities and other parameters viz. demographic changes, housing loan portfolio, level of economic and commercial activities, investors versus end users market, State Housing Policies and their impact, changes in income and employment profile in the cities etc. which would be a crucial policy input for Urban planning. Very useful information. Just a couple of clarifications and suggestions. First, I am not sure why Gurgaon is not on this list? Second, is it possible to have another version of this index, with relative positions of all the cities in the base year rather than assume it to be the same for each city? I think that would give a good idea about not just the growth but also the relative value of investments in real estate in all these cities. Thanks for sharing such an informative blog. Finding an appropriate office space for Rent in Wardha, is very essential to run your company. Never compromise when it comes to choosing a workplace for lease. wardha IT park is the best IT park in Maharashtra. Very useful information, specially for people who are looking to invest in real estate. These kind of articles are very helpful for property investers. Also read my blog 1 bhk flat in Pune hope you like it. Find new launch properties from reputed builders in delhi, gurgaon , Noida , faridabad etc Get real estate in delhi/ncr – buy , sell , rent , Real Estate Property in faridabad, buying real estate in delhi Ncr, commercial Property in faridabad , residential property in faridabad . Great information.Thanks for sharing.You can find the office property for lease at wardha IT Park. Hurry up. For more details about office property for lease, contact us. Residential Property in Faridabad- There are a lot of questions, which would be helpful for you in searching and finding right kind of home from real estate property for you. If you will contact with any experienced real estate agent that will help you more than expectation. He or she will save your big money and time because that agent has knowledge and experience of property, its features, its prices, and so on. Nice post, thanks for sharing. roperty is one of the most expensive resources for someone. We have extensive range of office space in it park. wardhaitpark is one of the biggest IT office In India.